Replacement Galaxy Note7 smartphones are safe, Samsung said in attempting to reassure customers this week after reports that consumers in South Korea, China and the U.S. said the replacement devices were running too hot. The fast charging of the Note7 devices and other devices using lithium-ion batteries could make them feel very hot, analysts said. Samsung first announced a global recall of 2.5 million Note7 smartphones in 10 countries on Sept. 2 following reports of fires due to problems with the batteries. About 90% of Note7 users have opted for a replacement Note7, Samsung said. Samsung also said there have been “only a small number of reported incidents” with the original Note7s. In the U.S., the Consumer Product Safety Commission recalled 1 million of the devices on Sept. 15 and said that it had received 92 reports of batteries overheating, including 26 reports of burns and 55 reports of property damage, including fires in cars and a garage. Samsung and wireless carriers are still focused on making exchanges, but many analysts are now eyeing the damage that the recall could cause to Samsung’s overall image and competitive standing in a crowded smartphone field. Estimates for the cost of the recall to Samsung have ranged from $1 billion to $2 billion. 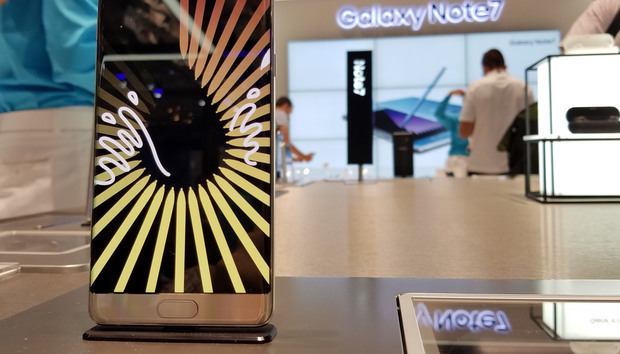 Immediately after Samsung’s recall on Sept. 2, its stock price climbed, with some adjustments, until Sept. 8, when the price per share reached a high of 1.639 million South Korean won (US$1,491). Then on Sept. 12, the price dropped to 1.465 million won (US$1,333). The price on Friday closed at 1.598 million won (US$1,454).